Ryanair workers make a bold step in their ongoing struggle for better pay and decent working conditions. Both cabin and ground crew from Ryanair bases across Europe met in Dublin for the first ever Ryanair Crew Summit. At this historic occasion, they have launched a Ryanair Crew Charter outlining the changes the company must make to bring it in line with comparable employers. The charter contains demands for a fair living wage, stable rosters and an end of promotion and disciplinary procedures being tied to in-flight sales. A key demand is also that employment contracts explicitly recognise national law and jurisdiction in the country a worker is based. 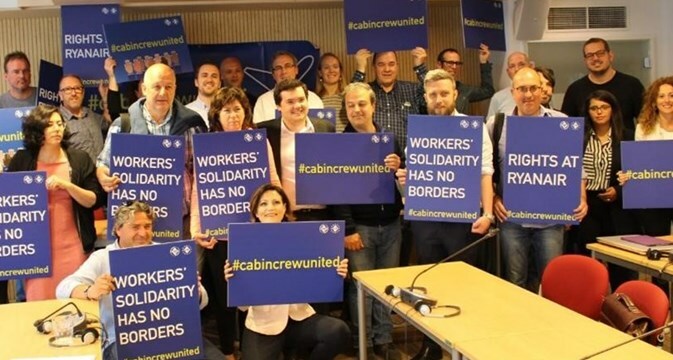 The summit was organised by the International Transport Workers’ Federation (ITF) and the European Transport Workers’ Federation (ETF), as part of the Cabin Crew United alliance. A united response is timely, given the appalling conditions on board of Ryanair flights. One particularly shocking procedure requires sick workers to come into work to fill in a company form explaining their condition. Civil Aviation is a battle front in the struggle for Fair Transport in Europe. In December 2017, Ryanair personnel scored a major when the airliner finally announced that it would recognise unions. However, since the company has introduced no concrete improvements over the last six months, workers are now moving forward by issuing a clear set of demands. If Ryanair fails to respond promptly and appropriately, industrial action in different national settings may not be avoided. Low cost carriers will never be a sustainable mode of transportation, unless they start treating their workers with a higher degree of respect.